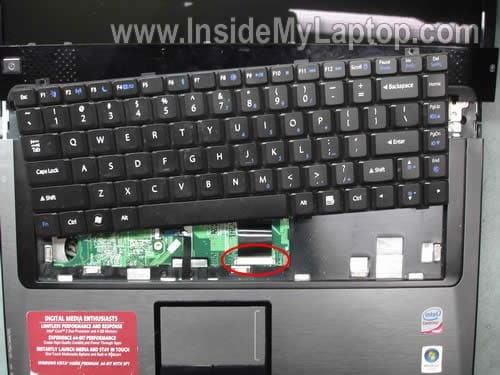 In this guide I will remove and replace defective keyboard on a Gateway M-Series notebook. In my case the model is: M-6846 but this guide will work for all other Gateway M-Series. If my guide works for you, please mention the model number in comments below. Turn off the computer, remove the battery. Remove one screw on the bottom. Carefully lift up one side of the speaker cover with a small flat head screwdriver. Continue removing the speaker cover with your fingers. Be careful, there will be a cable connecting the LED board to the motherboard under the cover. Lift up the keyboard and separate it from the top cover assembly. In order to unlock the connector carefully move the locking clip about 2 millimeters to the direction shown by two arrows. On the picture below you can see connector in the unlocked state. Now you can pull the cable from the connector and remove the keyboard completely. 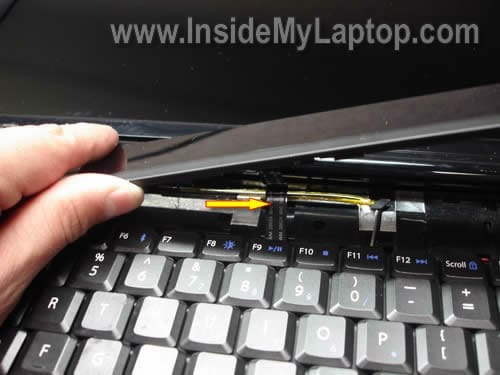 Replace it with a new one and assemble the laptop following all steps in the reverse direction. 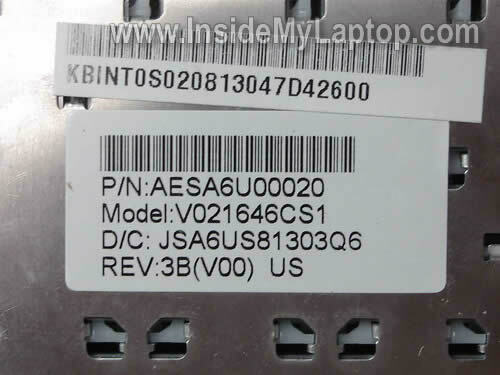 You can find a new keyboard for your Gateway M-Series using the part number from the sticker. In my case the part number is: AESA6U00020. 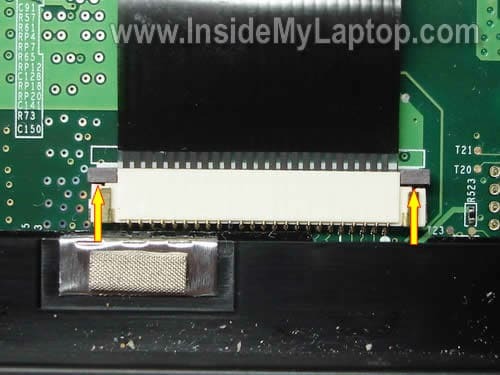 In the previous guide I explain how to replace the screen in the same Gateway M-Series laptop. after replacing my keyboard, non of the keys is working. help lpiz. after replacing my keyboard, non of the keys is working. Most likely the keyboard cable is not plugged correctly into the connector on the motherboard. Unlock the connector and reseat the cable. Make sure it’s seated properly. If you remove your laptop’s keyboard can you use a usb keyboard instead? 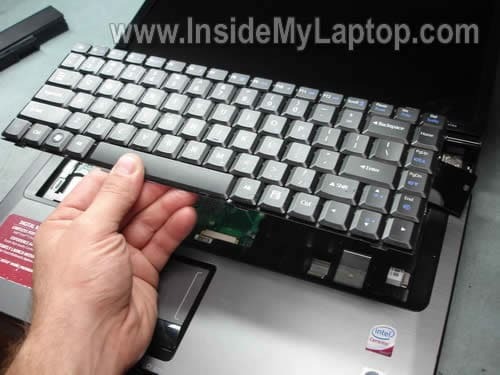 Yes, you should be able to use an external USB keyboard when the internal keyboard is disconnected from the motherboard. Thanks for the prompt reply. I would like to use my laptop with a usb keyboard while I wait for my replacement keyboard to arrive. Is it safe to use the laptop with motherboard exposed? I would like to use my laptop with a usb keyboard while I wait for my replacement keyboard to arrive. Is it safe to use the laptop with motherboard exposed? It depends. If you are careful you can. I do it all the time when I have to test laptops. i know this is about the keyboard, but my screen broke, i replaced it. the backlight no longer works. so i have it connected to my tv. what buttons do i press to change it from lcd display to the tv display? something like fn + f5? it is an acer extensa. if you have no idea i understand completely.. but im lost. thanks much! i know this is about the keyboard, but my screen broke, i replaced it. the backlight no longer works. so i have it connected to my tv. what buttons do i press to change it from lcd display to the tv display? something like fn + f5? I think it’s Fn+F5 for Acer laptops. Press on the Fn key and at the same time press on the F5 key. You might need to press on the F5 a few times until it switches from the laptop to TV. Also, make sure the TV is set correctly and ready for the signal from your laptop. 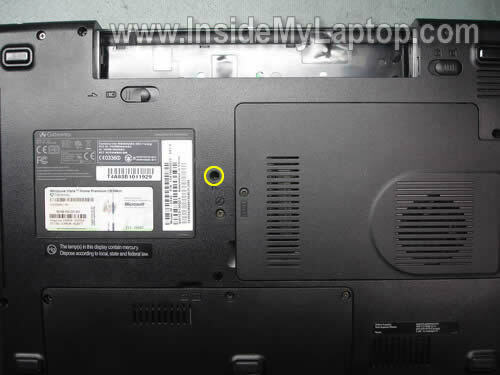 Gateway M-68xx notebook – has the screw labeled “K” mentioned in Step 1 *AND* a screw under the battery (mine is marked “M2.5×3”) which secures the keyboard/speaker cover. I have a gateway m 6846 laptop and my keyboard keys are not working properly. They don’t correspond to the key that I press. Is there a way to rest the keys or is it much worst and I have to replace the hole keyboard with a new one? my keyboard keys are not working properly. They don’t correspond to the key that I press. Do you have this problem with some particular keys or all of them do not work properly? I have a m6846 and my keyboard keys are ok, it’s the left key on my touch pad that has stopped working. Pressing on it does nothing other than make a clicking sound. Do you know of a reference for how to troubleshoot and correct that problem? Thank you. I have a m6846 and my keyboard keys are ok, it’s the left key on my touch pad that has stopped working. Pressing on it does nothing other than make a clicking sound. Do you know of a reference for how to troubleshoot and correct that problem? I cannot tell what’s going on without disassembling the laptop. 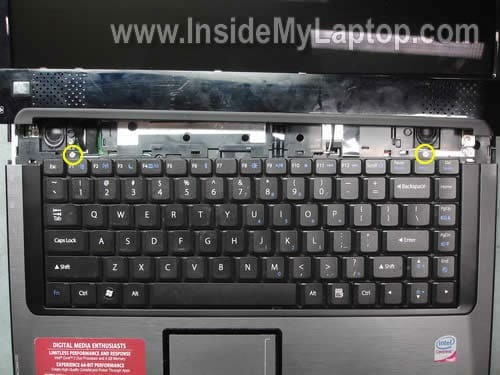 It’s necessary to remove the top cover and take a look at the button and left key. Thank you. It appears that the left mouse button when pressed engages another button underneath that is broken. It is part of the motherboard and I am told I would have to replace the motherboard to fix it. It appears that the left mouse button when pressed engages another button underneath that is broken. This is correct. There are small switches underneath plastic mouse buttons. When you press on the left or right button, you actually engage switches underneath. It is part of the motherboard and I am told I would have to replace the motherboard to fix it. These buttons-switches are soldered directly to the motherboard. If one of the switches fails, you’ll have to replace it with a new one or replace the entire motherboard. It’s possible that there is nothing wrong with the left but the plastic button-cover is broken. 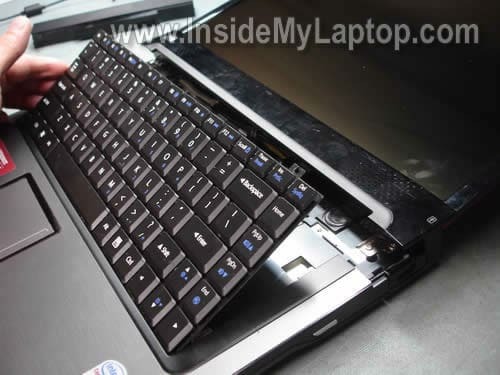 It’s necessary to disassemble the laptop and take a look at the left button from the bottom side. My M-Series (M-6888U) has a differnt speaker cover. It has one additional screw holding the cover in place. It is located in the lower left area of the battery compartment with M2.5×3 (screw size) embossed in the plastic. This must be removed to release the speaker cover. Another difference is my keyboard was only held in place by the one bottom screw. The screws shown in step 5 did not exist. This is probably due to the speaker cover being different in design (has an additional volume button & indicator lights). Thanks so much for all your instructions. This was my first attempt fixing a laptop (Coke is not the best drink for laptops :). I just used these instructions to change the keyboard on a M-7317U model and it went perfectly. The screw on the back was the thing I didn’t know about. I just did a keyboard replacement for a Gateway MX-6550. Very similar to your instructions, but there is a MAJOR difference! The bezel along the top of the keyboard is held onto the case by two screws on the back of the case. Specifically..if the laptop was sitting as it would be used, I call the back the approx. 1″ area where the hinges are located (not the underside). One screw on each side near the hinge screws holds the bezel’s covers that go over the hinges. I hope I’m explaining that correctly. Pry off cover AFTER removing screws or you’ll break the bezel! I just did a keyboard replacement for a Gateway MX-6550. Very similar to your instructions, but there is a MAJOR difference! The bezel along the top of the keyboard is held onto the case by two screws on the back of the case. I guess your Gateway MX-series is different than Gateway M-series. Take a look at this keyboard replacement guide for a Gateway MX-7000 series (page 42 in the manual). Is it similar to your laptop? I have M-6827 series. When I boot up the laptop, it said I have to enter the HDD PASSWORD. which I did not, or intentionally, put in. So I do not remember what the password is. Is there a master password or the CMOS battery in this series to reset the BIOS, please? I tried to disassemble the laptop, but I do not know how. I appreciate the know how on this matter. When I boot up the laptop, it said I have to enter the HDD PASSWORD. which I did not, or intentionally, put in. So I do not remember what the password is. Is there a master password or the CMOS battery in this series to reset the BIOS, please? The hard drive password cannot be removed. If you forgot the password, you’ll have to replace the hard drive with a new one. Also, you cannot access data on that drive. How about video on the external monitor? Does it also have 7 screens on the right side? I have a Gateway M-Series and my trackpad/mouse dont work :(… Can you explain how to disassembly it? Has anyone tried this with the m-6750 series so I dont go trying to take it apart and need to do something a lil different…. 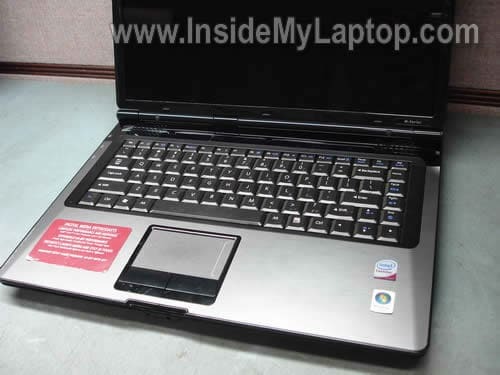 I have a Gateway T series laptop… The keyboard looks JUST like yours… DO you think it would be the same? I dropped something on my laptop & messed up the keys… I’d like to try & fix it before spending hundreds… Hellllpp! Just remove the keyboard and search for the part number on the sticker. Google the part number and find the replacement. I have a laptop NV5813 and the power button doesn’t work at all. 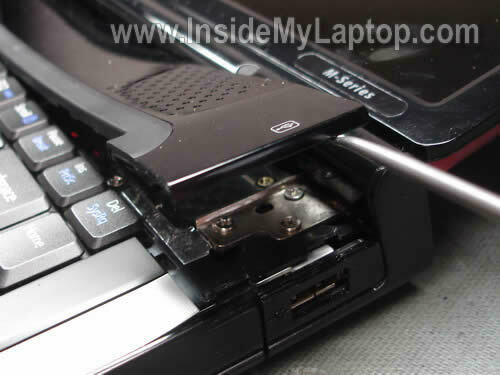 Do you have any idea about how to fix that and how to open the laptop. My pause break key popped off of my keyboard of my gateway m-series. I’ve tried placing it back for hours but i cant get it. there were two plastic pieces under the key when it came off. I still have them but how do i place them back? This worked on my Gateway M-7315U. The instructions were great. I would have had problems doing this myself. Thank you very much. So if I do in fact “snap” that black cord that transmits info from the LED board to the motherboard, is there any way to put it back in its place to make the top panel work again? I had a hard time taking the top panel off and in an act of frustration pulled too hard and snapped the cord out. I don’t know where it goes. So if I do in fact “snap” that black cord that transmits info from the LED board to the motherboard, is there any way to put it back in its place to make the top panel work again? Just remove the keyboard and plug the cable back into the connector. hey i was wondering i have a m-7356u labtop my keyboard is starting to fail i cant find a replacement where can i buy a replacement. do i need to remove the keyboard and fine the part number? I have an M-1631U. My keyboard is fine, but one of my speakers no longer works. I’m interested if you could guide me through checking the connection to it? One speaker still works, but I “jostled” the computer one time and the other speaker started going in and out, and now it doesn’t work at all. Either it’s broken (I hope not), or I just need to tighten whatever has become loose. Could you email me? Thanks! Ok, it worked with the M-1631U. Though I’d stress two things; 1) The “LED” strip’s brushed metal bends quite easily. 2) Putting the cable back into the connector for the keyboard is HARD! These instuctions worked for the Gateway m-7305 also. Thank you for the directions. I just replaced my M-Seies M-151S keyboard. It took 15 mins tops! How can I replace the left click mouse button? Is it loose or broken plastic? What’s wrong? Both buttons are part of the top cover assembly. If one of them is broken, you’ll have to replace the top cover. The left button is loose but still works can I remove the touch pad and replace the plastic button? it’s a M-7315U ,if not do you have one and if so how much is it? I forgot to add how much is the top cover? The left button slide over to the left side and locks up under the cover. Then I haveto pry it back out. The left button is loose but still works can I remove the touch pad and replace the plastic button? Most likely this button is part of the top cover assembly. I think you’ll have to replace the top cover. No, you cannot. This laptop has onboard video – the video card integrated into the motherboard. These instructions worked for the M-7315U, it took about 15 minutes. what’s the importance about the number in back of keyboard? 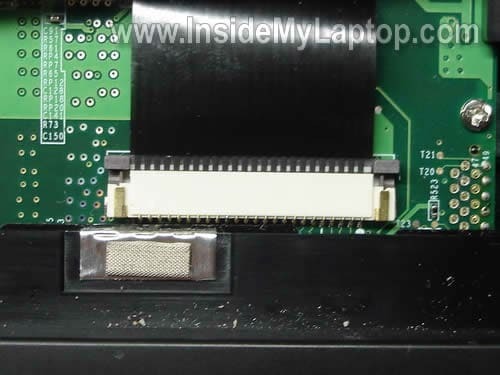 i opened my laptop Gateway M-Series M-6851 and removed the keyboard. the number back is totaly different. does it servesto my latop? or need to be the same number? Hello, i love this, thank you it worked for my m-1631u, this was helpful. 2 Questions since i cant find the answer aywhere,. 1) have been looking for a bluetooth module, Peope say the Dell Wireless 370 is the right one for the laptop, which I have found on ebay and the like(unless there is a real card for that isnt a Dell one), and it looks like need an antenna since i see the micro antenna ports for them, but I have no other wire on that side, since I see the port for it next to the wifi card, iam guessing that is the bluetooth card slot (please correct me if iam wrong). Does it really need an antenna wire or not? If so have you taken you laptop apart and seen the wire hidden? I have no schematics for the slots anywheer and the gateway site doesnt have any pdf or anything to show what goes where. 2) This goes along with the no schematics, is it possible to upgrade my wifi card which is a b/g to an b/g/n card in the wifi slot? Reason why I see some wifi cards that say it is N but it has 3 antenna ports and i see some N cards that have only 2 antenna ports. Any ideas? No manuals or anything anywhere so I can stuck. I hope you will answer these or at least point me in the right direction. Two screws under battery have to be removed to pull off sppeaker cover. To get keyboard out. Mine only had the one screw underneath plus the two on top. Need a long thin screwdriver to pry off top cover, as it is pretty tight. Otherwise, very easy, especially compared to the HP DV7 I just went thru for a bad cooling fan. Worked great! Quick and simple! Gateway SA6 keyboar. Thanks for the info.